Here is another Commercial Use freebie for you. 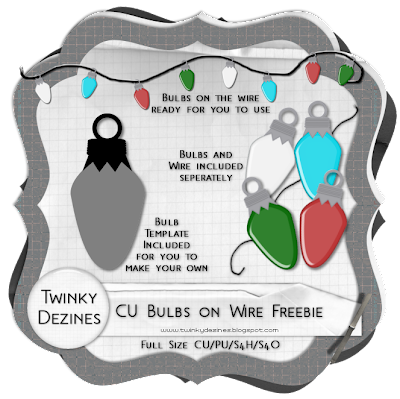 These are bulbs on a wire, good for your christmas layouts/Tags! Included in the zip is, 2 sets of ready made Bulbs on the wire, one with a shadow and one without. The Bulbs and wire and also all included seperately. There is also the Bulb Template for you to make your own bulb if you choose. You can download them HERE please let me know you snagged. Hope you can find a use for them! These are awesome! Thanks so much for sharing! Twinky these are great!!!!!!!!!!!!! tyvm for sharing them with us! Great freebie ! Thanks a lot !! Thank you very much. This is another great freebie. CU Freebies Only Forum on Sunday December 13th 2009, in this topic : Christmas :: Templates ,Your Place to find Commercial Use Scrap Booking Freebies! Thank you so much for this Freebie. I want to let you know that I posted a link to your blog in CBH Digital Scrapbooking Freebies, under the Page 1 post on Dec. 13, 2009. Thanks again. Thanks so much for this great freebie! You are so clever! I like these! They will sure come in useful. Thank you! awesome... thanks for sharing your talent. thank you so much for the bulbs and blog train. been off line due to computer probs. thank you very much for your great freebie and also for the wonderful baubles freebie. Happy Holidays! Thank you honey, they are great!